I'm back! Wow, I can't believe how long I have gone without a post. This farmers' market gig is wonderful, but it has taken up more of my time than I initially thought it would. But to be completely honest, I have loved it, and so has Mr. HFA! We have met the best people, customers and other vendors. It really has been a great experience and one that we are going to continue for the rest of this summer. Speaking of meeting great people, we were fortunate enough to become friends with another vendor. She does wonderful woodworking and makes some great homemade noodles that she sells. They invited us over this past weekend to pick cherries and mulberries. We were excited at the thought of getting both as we do not have either on our farm. 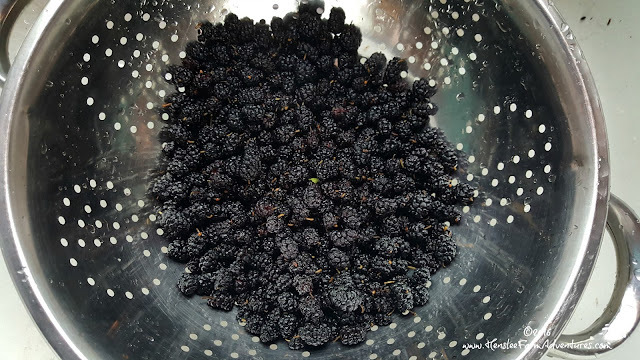 We were able to pick a bucket of cherries and a bucket of mulberries. This weekend, I made a mulberry cobbler using my mother-in-law's blackberry cobbler recipe. I thought it would be perfect to share with you. This recipe is so easy! 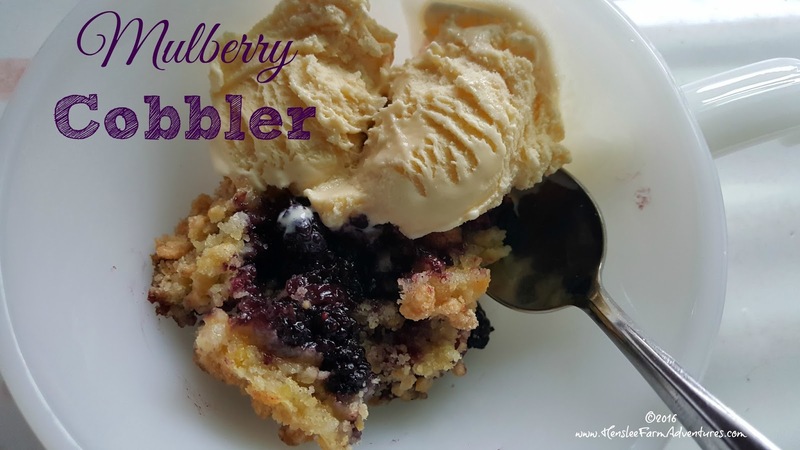 It is not your regular cobbler. Growing up I had one grandmother that would make cobbler that had a cake-like crust which was yummy. The other grandmother would make her cobbler using pie crust, which was equally good! 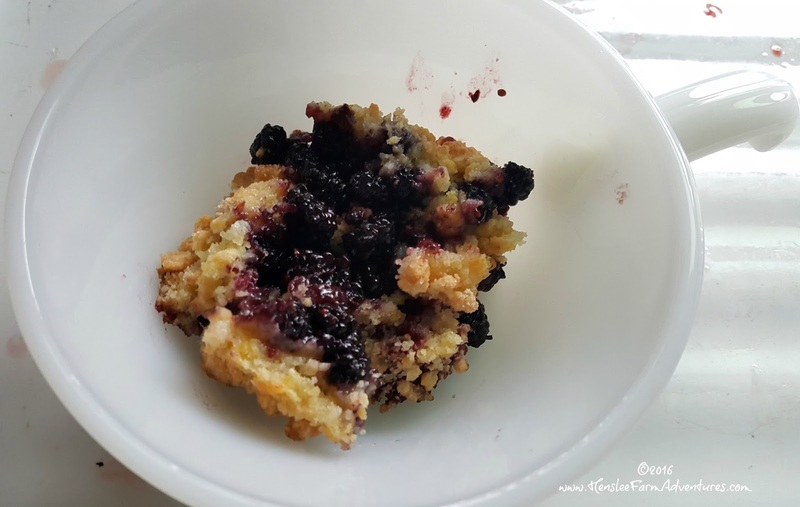 I have found that there are several different ways to make cobbler, and I have not met a cobbler yet that I do not get a long with! For this recipe, it uses a crumb-like topping which makes it very easy and very fast to put together. Beautiful berries. These were so sweet and juicy! Preheat your oven to 375°F. Next you need to wash your mulberries. Aren't these beautiful? They look a lot like a blackberry. I have to say that I had a hard time not eating them as I was picking them! After they are washed, put them in an 8x8 dish and put 1 tablespoon of lemon juice over them, then set them aside. Ingredients. I am missing the butter. 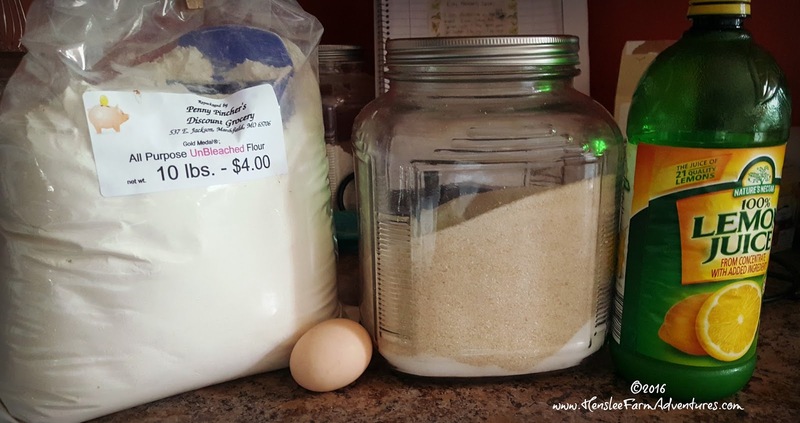 Then mix together 1 large egg, 1 cup of flour, and 1 cup of sugar. 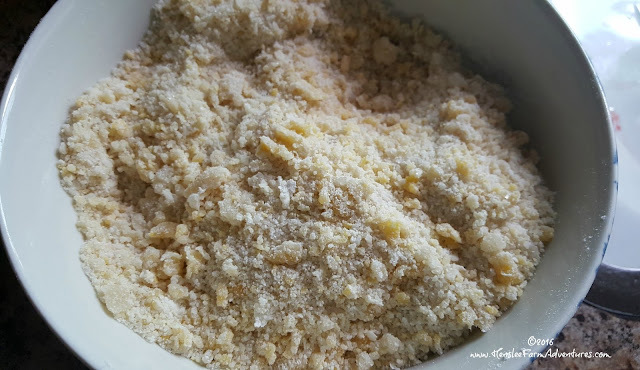 Mix until it resembles crumbs, like below. 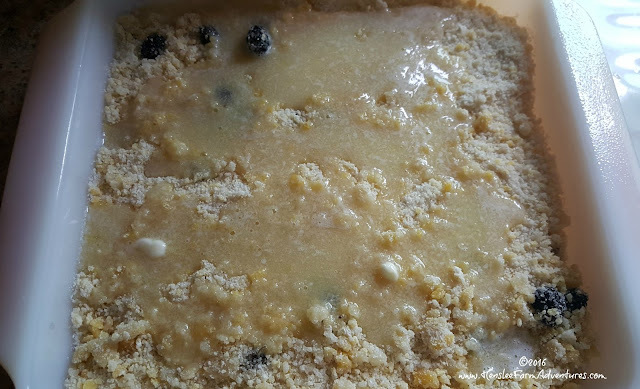 Make sure that you mix it up until it resembles crumbs. Take this mixture and pour over the berries, making sure that it is even and they are covered. Next, melt 6 tablespoons of butter and pour over the flour mixture that you just put on your berries. (Sorry I forgot to include butter in the ingredients picture above). Flour mixture is on berries, and then butter is poured on top of that. Put this into your preheated oven and bake for 35 minutes or until it is golden brown. A beautiful golden brown. This looks delicious! Doesn't this look amazing? It was hard to keep from diving right into this dessert, but we somehow managed to show some restraint and were able to wait until after supper for this special treat. This looks so good, but it really needs a friend. Now my cobbler is happy! Cobbler and ice cream, what a treat! Vanilla ice cream! The only thing that could make this any better is if that ice cream were home made. But alas, we can't have everything! As you can see the recipe is super simple, and super quick. The perfect dessert for when you are having company and don't want to spend a lot of time in the kitchen. 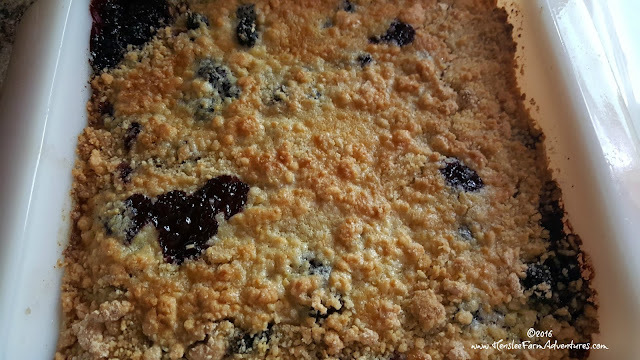 This dessert would also work well with blackberries, raspberries, and blueberries. Would you like a printed version of the recipe? Click here. Let me know what think about the recipe in the comments below! Also how do you use your mulberries?